Hop aboard the Time Truck this May half term and discover the archaeological remains uncovered along the route of the project, with displays and activities for all the family. If walls could speak… they would reveal how they hold the key to real life stories, of medieval men and women lost in the shadows of history. Hear about the medieval beasts, knights battling unseen dragons, ships sailing across lime-washed oceans and the demons who stalk the walls of our churches. For centuries these carved writings and artworks have lain largely unnoticed… until Matthew started his nationwide survey. All welcome (Members: Free; Non-members: £3.00). n April 2017 Ramsey Abbey Community Project was born. What have we discovered and what has the project added to our knowledge of the site? The Great Benedictine Abbey of Ramsey was the first of the great religious houses in Eastern Fenland to be founded and in its time one of the most important, influential and wealthiest Abbey in the Fens. In its heyday it was home to at least 80 Monks, and behind its walls a renowned school was founded in about 985. For over 500 years the Abbey flourished, but in 1539 the Abbey was dissolved by Henry VIII. Today there is very little to see of the once great Abbey, only a wonderful 15th Century Abbey Gate House. Roger started his archaeology life at Fane Road and launched the Warboys Archaeology Project in 2012. The Ramsey Abbey project is the latest of the team’s work. Come and find out what OAE's archaeologists have recently discovered at the new North-West development, including an unexpected early Anglo-Saxon cemetery. FREE drop in event for members of the public to see finds, photographs and meet the archaeologists involved. Visit the Time Truck, one of many attractions at this year’s Huntingdon Riverside Gala, to discover the archaeology of the A14C2H, with displays and activities for all the family. Throughout 2018, we are featuring a different Jigsaw resource guide each month to inform and inspire community archaeologists about best practice. Jigsaw has produced various guides on techniques for researching archaelogical sites, identifying archaeological artefacts and on recording and reporting the results of archaeological investigations. Following the excavation of a Romano-British farmstead in a field adjacent to their school last autumn, students in Cambourne Village College's Archaeology Club are opening the doors to their Heritage Lottery Funded 'pop-up' archaeology museum. The museum is completely designed and curated by the Cambourne Village College students and will include displays of finds from excavations in Cambourne, artwork produced by both primary and secondary school students and hands-on activities for visitors. The students will be on hand to showcase the artefacts on display and explain the role they played in last autumn's excavation. Admission to the museum is free of charge and there is visitor parking directly outside the school. Road widening, new junctions and a 17-mile bypass south of Huntingdon carve through an archaeological landscape covering all periods from the earliest hunter-gatherers to WWII. The investigation and mitigation work by MOLA is on a corresponding scale and is due to complete March 2018. More than 25 settlements have been uncovered, including: Iron Age, Roman, Saxon and Medieval sites. Helen O’Hara will provide an overview of the archaeology arising from the project. There will be specific focus on a Saxon and a Roman site. In the last 15 years, research on Stonehenge has revealed a wealth of new evidence about this enigmatic monument and its builders. Discoveries at Stonehenge and surrounding sites include new information of the people buried there, the houses that they lived in, and relationships of Stonehenge to its surrounding landscape. New scientific techniques such as analysis of ancient DNA and isotopes have also transformed our understanding of who these people were. Geological studies have also paved the way for archaeological excavations at some of Stonehenge’s distant quarries in Wales, to cast light on the mystery of when and why some of its monoliths were brought from so far away. Mike Parker Pearson is Professor of British Later Prehistory at UCL’s Institute of Archaeology in London. Since 2003 he has been leading a multidisciplinary team investigating Stonehenge, and has also worked in many different parts of the world, from Greece and the Middle East to Madagascar and Easter Island, during his career as an archaeologist. Entry into the Museum is FREE, although donations are welcome. Car parking is also free in the car park opposite the Museum. Wisbech & Fenland Museum and FenArch are helping to launch an 8-16 Fenland Archaeology group. Since the 2009 Wisbech Castle Dig and the formation of FenArch, publicity has created interest amongst young people in the area. The museum already does some outreach work and FenArch also work with local schools. The Wisbech High Street project funded in part by HLF is carrying out a community Big Dig in the museum grounds in May and June. We’d love to see some of your members at any of these and do introduce yourselves if you see me there, I can tell them about other upcoming activities! Our media launch was last week and there was wide coverage across local and national press, TV and Radio Cambs and the website is live: www.molaheadland.com/a14c2h There is a series of regular news blogs now and an events sections where they will find all details of public events such as our open day and Time Truck activities. Social media can be found on facebook and twitter @a14c2h (where the news of diversions & construction is posted) and using #A14Archaeology you will find some @mola and @headland social media posts. A14 Archaeology Open Day based at Brampton site offices near Huntingdon – this Saturday 7th April 10am – 5pm, drop in for free (no booking needed for this) to see: displays, hear a 15 min overview, meet archaeologists, see environmental and data team, do family dig box & recording, craft activities and view drone and general slideshows, also a live link and recorded site tour. Bookings for site tours on that day are now full as a result of the media last week. A14 Archaeology Open Day, groups only – this Sunday 8th April based at same location, at tour times starting at 14:15 (17 places max), 11:05 (28 places) , 10:25 (28 places) , 9:45 (28 places) in our order of preference, I have some availability to take additional groups, after booking all those on a long waiting list into their times. The intro talk + tour in our own minibuses departs from the same location, Brampton compound near Huntingdon, map attached. facilities at Brampton are fully accessible, less so on site but are available. Bring own food if booking close to lunchtime, water and coffee/tea available. Time Truck family activities – the first one at Tesco, Bar Hill in half term on Thurs 31st May, 10:30 – 4:00, free of charge. Displays, selection of finds, activities including mini-dig with recording, craft activities. 21st July Castle Hill Open Day, next to the HER archaeology open day behind Shire Hall. 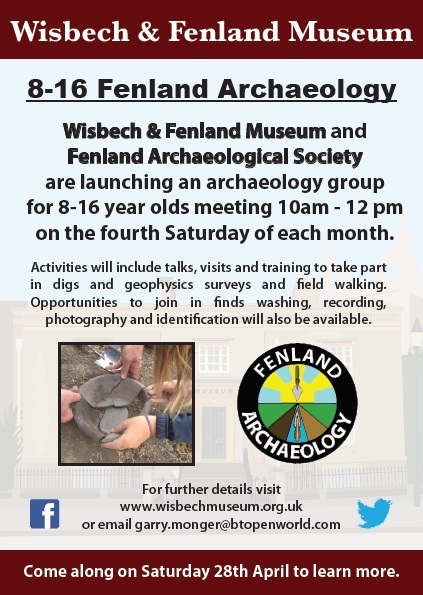 The Jigsaw-affiliated community archaeology group FenArch are launching a new Fenland Archaeology group next weekend aimed at 8-16 year olds in partnership with Wisbech & Fenland Museum. There will be an open day this Saturday, 28th April 2018 between 10am - 12pm at the museum for young people to find out more. The group will meet on the fourth Saturday of each month and activities will include talks, visits and training to take part in excavation, geophysical surveys and field walking. There will also be opportunities for young people to join in finds washing, recording, photography and finds identification. Since the 2009 Wisbech Castle dig run by Oxford Archaeology East and the subsequent formation of FenArch, there have been a lot of interest from young people in the archaeology of the area. The museum already does outreach aimed at yound people and FenArch regularly work with local schools so this is a chance to bring together their experience and offer an exciting new club to the young people of Wisbech and the surrounding area. Together with the Wisbech High Street project funded by the Heritage Lottery Fund which is carrying out a community 'Big Dig' in the museum grounds in May and June, local people will have several opportunities to learn more about archaeology in 2018. An introduction to the use of low cost geophysics. Many groups throughout the UK now conduct their own geophysical surveys, this talk explains what techniques are available and how these can be best used. The talk will include survey examples from both local and worldwide sites. Bob was previously a Senior Electronics Engineer for Baker Perkins and now director of TR Systems Ltd. Bob has designed state of the art electronics and geophysical survey equipment which has been used worldwide by both professional and amateur archaeologists. This talk provides an overview of the hunter gatherer communities who lived in and around what is now the Fenland, from the earliest colonisation by small groups of hunters at the end of the last glacial maximum (c. 12,700 BC) until the beginning of the Neolithic (c. 4000 BC). This is a timespan that saw major changes in climate, sea-levels, flora and fauna and the record of archaeological activity will be related to increasingly detailed understandings of these environmental changes. The talk will emphasise the effects of changing landscapes on the lifeways of Upper Palaeolithic and Mesolithic hunter-gatherers and explore the special opportunities that the Fens offer for studies of this period. Lawrence Billington recently completed a PhD on the Late Upper Palaeolithic and Mesolithic of Eastern England and is currently a project officer at Oxford Archaeology East. Free to members, a charge of £4 for non-members. Throughout 2018, we will be featuring a different Jigsaw resource guide each month to inform and inspire community archaeologists about best practice. Jigsaw has produced various guides on techniques for researching archaelogical sites, identifying archaeological artefacts and on recording and reporting the results of archaeological investigations. This month's featured best practice guide is: Step-by-Step Guide to Conducting a Geophysical Resistivity Survey - a practical hands-on guide to using the RM85.